Maria Esther de Capovilla - officially the world's oldest woman - has died in Ecuador aged 116, relatives said. Capovilla died at dawn on Sunday in the coastal city of Guayaquil after succumbing to pneumonia. Her funeral was planned for Monday. Born in 1889, the same year as Charlie Chaplin and Adolf Hitler, Capovilla was 22 when the Titanic sank and 79 when astronauts first set foot on the Moon. Her family said donkey milk might be key to her longevity. Capovilla was born in Guayaquil, to a well-to-do Ecuadorean family which traced its ancestry to the Spanish conquistadores. She was said to enjoy painting, embroidery, dancing and walking. In her youth she would also drink fresh milk from the donkeys at her aunt's farm - something relatives credit with helping her live so long. She is said never to have smoked, ate regular small meals, and only drank in moderation. She was also fervently religious, and took communion every Friday, said reports. 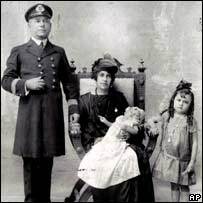 She married Antonio Capovilla, an Austrian sailor, in 1917, and was widowed in 1949. They had five children, three of whom are still alive, and 11 grandchildren, 20 great-grandchildren and two great-great-grandchildren. She spent the last 20 years living with her daughter and son-in-law, and generally enjoyed good health, Robert Young, adviser to Guinness World Records, told Associated Press. "She was in good shape until she had a bout of pneumonia and she died unexpectedly. Her family was expecting to have a 117th birthday party," Mr Young said. "They had recently said that she was in good health." Capovilla was officially certified the world's oldest woman on 8 December 2005, after her family sent extensive documentation to the Guinness World Records. 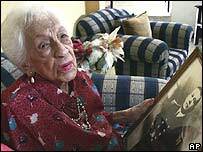 Capovilla's likely successor as oldest woman is an American, Elizabeth Bolden of Memphis, Tennessee, said Mr Young. "She is 116, but she was born 11 months after Capovilla," he said. The oldest man is 115, and the oldest person ever to have lived is documented as Frenchwoman Jeanne Louise Calment, who died in 1997 aged 122. What would it be like to live to 175?